When we at MRM attend open house events, we do our best to set up on a public sidewalk and not impede traffic. We offer a newspaper with articles related to the new temple; over the years, we have passed out hundreds of thousands of copies. (Check out the current paper here!) Thus, we get the chance to talk to many of Latter-day Saints who may not appreciate our attendance at this event. Here are the 10 most common responses/ complaints we receive and a synopsis (150 words or less in each response) on how we answer the complaint. Actually, the first thing I do whenever I begin a temple outreach is go on the tour. I do this for several reasons. First of all, I like to see the presentation, as it differs from open house to open house. For instance, most tours are “silent,” with the guests merely walking through the building and having no official explanations offered. In others, including the August/September 2016 Philadelphia open house, short descriptions of each room are given by the ushers stationed in that room. Sometimes questions in the rooms are entertained! Most Mormons who ask me to go inside probably assume that I haven’t taken the time to do so, even though I have. While deciding to go through a temple is one’s personal decision, another advantage I see in going through is letting LDS friends and neighbors know you visited. When they ask, “What did you think?” you have the ability to start a conversation. Were you once a member? The person asking this question is wanting to determine my motive for why I would take the time to stand on public property outside an open house event (usually in the hot sun!) and attempt to distribute this information. The assumption many Mormons have is that I must have left the church, probably because I couldn’t handle the responsibilities required of the membership, and that I must be bitter. The fact of the matter is that I never was a member of the Mormon Church. Mormons often respond with incredulity. “Well, if you never belonged to this church, then why are you here?” Should we only be concerned about evangelizing those who once belonged to our churches and then left? Or should we be concerned about everyone, regardless of their backgrounds? The answer appears obvious. I love Mormons and want to share biblical truth. It’s rude to stand outside someone’s church and protest. How can handing out literature that describes the differences between Mormonism and biblical Christianity be equated with a “protest”? I don’t think anyone would consider it to be a “protest” when the missionaries knock on people’s doors and don’t give up their pursuit, even when those inside the home say they are “Christian.” After all, it would be silly to say that Consumer Reports is “protesting” when it reports how one company’s car is not as good as its competitor’s. As far as standing outside someone’s church, Mormon temples are closed on Sunday because they’re places of work. In actuality, it’s not a “church” the way “church” is traditionally understood. Once the public open house event is over, I leave and never return.. Mormons believe in agency, and I believe showing both sides—especially to nonmembers—is true agency. After all, a person who doesn’t comprehend both sides will not be granted an authentic choice. We don’t stand outside your church and do this. This complaint is more concerned with tactics rather than motive. I like to point out that, yes, handing out literature at a public event is a tactic that certainly not everyone may be in agreement with. It might not even be what most Mormons choose to do. Then again, many people think it’s an intrusion to have LDS missionaries knock on their doors and attempt to engage in conversation, hoping for the possibility of being invited inside. While I’m fine with this tactic, others do consider this an invasion of privacy. Should this mean that the missionaries shouldn’t knock on doors because some might find the tactic objectionable? I find that returned missionaries fully understand my rationale for doing what I do, agreeing that my tactic is fine as long as I respect others (which I do). 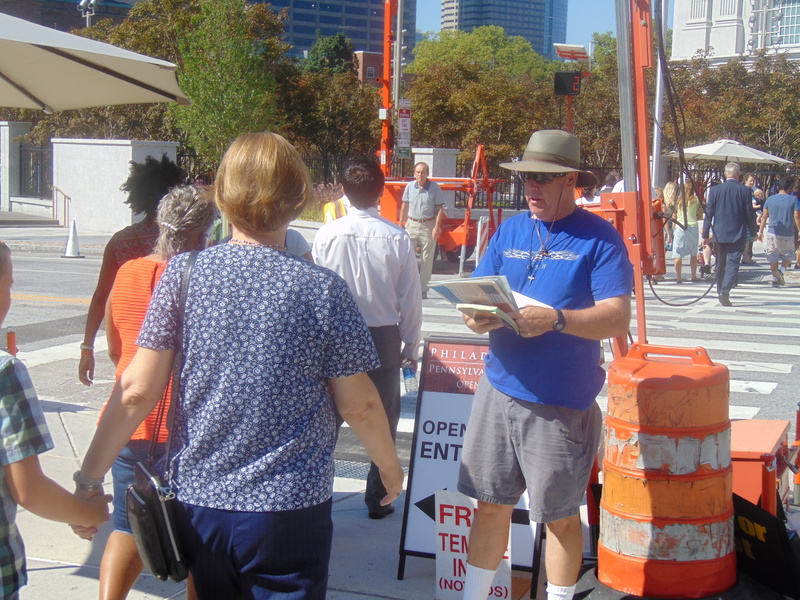 Unless the LDS Church decides to give full information about what goes on in their temple, I will continue to participate in outreach events to temple open house events. You must hate us badly to be here. You would be hard-pressed to find anyone who would say that Mormon missionaries are motivated by anything but a sincere desire to share their faith with those who are not members of their church. Why is it, then, that Bible-believing Christians who desire to share their faith with members of the LDS Church are oftentimes accused of being hateful and bigoted? Efforts on the part of Christians to discuss the teachings of Mormonism are often looked upon as acts of persecution. Could it possibly be, though, that these Christians really do care and want nothing more than to share their faith in a public format, following what Ephesians 4:15 says, which is “speak the truth in love”? If we didn’t care, we wouldn’t be here. How come you don’t do this at the Islamic mosque or the Jehovah’s Witness Kingdom Hall? This would be akin to me telling the missionary at my door, “Why don’t you knock on the Muslim’s or Jehovah’s Witness doors?” When you think about it, they probably do. And by golly, so do I. In fact, every year I go outside the JW Convention held during the weekend nearest July 4th in Ogden, Utah, as thousands of Jehovah’s Witnesses listen to their leaders. I think the Watchtower Society is just as wrong as the leaders of the Mormon Church. Although Jehovah’s Witnesses are typically not as willing to engage as many Mormons are, I have attended this convention every year since moving to Utah in 2010. I place several dozen website signs down the street used by those driving away from the parking lot, directing them to my website www.FollowTheChrist.com. The complaint used here is nothing more than a smokescreen (a red herring) and meant to divert the issue. What you’re handing out is full of lies. I have seen your side and it doesn’t stand up to what this church believes. Many times those who once belonged to other churches (both Catholic and Protestant) will make this claim. I like to find out which church they once attended; more often than not it was a liberal Protestant or Catholic church. Because they didn’t feel truth was lacking at their former places of worship (I would agree with many of their complaints! ), they found a refuge in Mormonism. I believe many who tell me this really didn’t understand biblical doctrine in the first place. If I get a chance to talk to someone with this complaint, I like to ask, “Which doctrine in Mormonism gets it right over what the Christian church has taught?” Ask the Mormon to define theological terms as well. For instance, I have never found a Latter-day Saint who can give me an accurate description of the biblical teaching of the Trinity. If the Mormons don’t accurately understand what Christianity is teaching, then have they really “seen (our) side”? If Mormons are wrong and you’re right, we still get to go to your heaven. While this response is rare, I see it more and more in this Post Modern culture we now live in. Some Mormons are convinced that, if by chance they’re wrong, they will get to go to the heaven that I believe in because they have faith in God and Jesus. One Mormon recently told me, “If you believe that it is by faith a person is saved, and if I have faith in Jesus and His atoning work, then I get to go to the same place you hope to go to.” In other words, he believes he wins regardless of who’s right. (For some reason, I don’t think this is what Blaise Pascal had in mind with his “wager.”) What a Mormon using this argument does not understood is that the LDS doctrines on essential issues completely contradicts biblical teaching. Much more is needed than good motives or authentic sincerity. If I wasn’t wearing this suit, I’d beat you to a pulp. Very rarely I meet Mormons who may not be faithful and who appear surprised to find me at the open house event. I don’t take comments like this seriously, but at the same time, I don’t want to antagonize. Silence to this threat is my typical response. As I mentioned earlier, a Mormon might not like the tactic of sharing truth at an open house event. Fortunately, the First Amendment (at least for now!) is on my side. A person doesn’t have to agree with the message, but we live in a country that allows differences in opinions. As long as the free speech is within bounds and follows the law, those in disagreement cannot stop it. Violence is not the answer from either the Mormon or Evangelical Christian point of view. For more on temples, go here.